This is an exciting Top 5 week. It’s anybody’s game. All of the remaining singers are excellent and diverse, which will make for some interesting voting numbers. 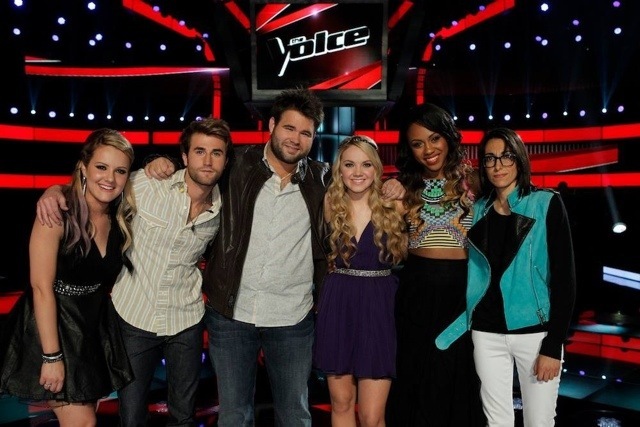 The Voice Top 5 Performance Show airs Monday, June 10th, with the Results Show on Tuesday, June 11th at 8:00 P.M. on NBC. Good luck to the Top 5! Should be a great show! Enjoy the show and don’t forget to add your comments as we head into the home stretch of Season 4.
i love how the coaches love their people. i’m especially thinking about usher and how he feels about michelle. i just found out sasha was a backup singer for christina. hmmm! and sang on broadway for a long time. Hunter…I didn’t care for Sasha’s ~ Whitney song…but I did like her Donna Summer song!!! Did anyone see the show that came on after the Voice” the winner is”…it was pretty good. I had been supporting Sasha but was disappointed in her performances last night. I don’t think she was strong enough. OTOH, Michelle killed it with, “Time after Time.” Such a gorgeous song! The Swon brothers seem to be average for a duo. It depends if they get a contract whether they’ll succeed. Strange. I loved Sasha. But, I have to admit, I was watching while speaking with company here so maybe I missed something? In the end, though, it will come down to Danielle or Michelle. And, as much as I love Danielle, I hope Michelle wins – for no other reason than I would like to see a non -Country winner for a change. However, Danielle is going to be a huge star. MCL, I loved Sasha’s performance too. I especially loved the tenderness in it. Danielle blows my mind. She sings with such ease, what an incredible talent! I thought Sasha was pretty good but she didn’t compare to Whitney Houston. It was difficult to hear her first few lines and there were a few rough patches, but she did change the song up a little and put her own stamp on it though. I also liked the Donna Summer song better. Sasha’s problem for me has been a lack of distinction in her voice. I didn’t know she was a backup singer with Christina but I’m not surprised that she was a backup singer. She’s a nice young lady that I liked since her audition. Her performance ability, stagecraft and especially conveying an appropriate amount of emotion in her singing have really improved with Shakira’s help this season. I hope she is able to do well for herself and her family in the future. I agree that it will come down to Danielle or Michelle. Danielle shows remarkable poise and composure for a young girl and occasionally has a nice tone. Blake is very loyal to his contestants and I’m sure will help her get her career on its feet. I expected her to get choked up when Tim McGraw videoed in and especially singing to her parents. I’m not sure what is so “brave” about Michelle. There have been similar contestants in each of the three previous seasons. Her voice isn’t bad but I would prefer her without the squats or the agenda. We have had two R&B / Pop artist, one Pop / Pop-Rocker who did a little country during her season as winners in the first three seasons. I’m not seeing a glut of Country artist having won The Voice. There have only been two in Idol’s history. There were a large number of Country contestants this year and even Country songs sung by the Pop and R&B contestants. The thing that the previous winners have in common is being professional band singers. One backup, one lead and one who did both. The Voice seems to be a haven for former backup singers . I have no idea where Michelle comes from professionally, but I’ll bet she didn’t just fall off of a turnip truck with that act. On the other hand, Danielle looks to be the real deal; a kid whose previous experience was singing into her hairbrush in her bedroom. Go Danielle. I saw the new show that you mentioned. How about Lakisha Jones? Didn’t she leave Idol under a cloud of controversy? The girl leading after the first round looks like Kelly Clarkson and Carrie Underwood’s love child! It’s an interesting take for a light hearted singing competition and does away with the pretense of not being a reality show. The “101” judges may be the best idea yet. No personalities, quick results and they seemed to use pretty good collective judgment, getting it right each time. Yes! Lakisha right outta the gate…the guy that beat her should have went on to beat the duo guys that the last young lady went up against…I like the instant results, and if the 101 judges aren’t sucked into back stories it could prove to be really entertaining!!! Hmmm…trying to remember about Lakisha…didn’t she leave in top four or five? That girl can sing!!! I have only watched The Voice very sporadically this year, and I’ve never heard Danielle sing, but every time I turn it on I seem to catch Michelle and I love her voice!!! As for the other show that Vonnie mentioned, I’ll try to make a point of seeing it because I love Lakisha Jones. I think she left Idol in 4th place. Lakisha was the first contestant but she was voted off…it looks though like it’s going to be pretty good. gene!!! i’ve missed you! i kept wondering where you were! so nice to read you again. How are ya man? I’ve been trying to reduce my digital foot print lest Google rats me out I find myself being audited by the IRS, raided by the BATF or EPA, or maybe even droned! Who knows now that it’s “1984”in America again? Life is good though. Who do you think will win this season? I suspect that the country vote will be split between the Swons and Danielle leaving Michelle in the lead. She has been popular with the studio audience. It occurred to me today that there is a skew in the iTunes voting that doesn’t exist in the other voting formats. I’m not referring to the fact that they multiply those who chart in the top 10 by ten. I think that is a good thing because actual sells should have more weight than hot air and speed dialing. Let’s say you have 20 fans, 10 pop and 10 country fans. All ten pop fans might buy Michelle’s download from iTunes. The 10 country fans may each buy Danielle’s iTunes download. They may also buy the Swon Bros digits. So 20 people have voted with the effect of 30 people and if all 20 of these hypothetical fans bought the down loads of all three contestants, they would have voted with the effect of 60 individual voters. Then there is the times ten effect that could take that voting power to as much as 600. Just a small effort on the part of a handful of people can have a serious affect on the outcome. gene…i wondered if maybe that was the case (“trying to reduce my digital foot print lest Google rats me out….”). 🙂 i don’t know who will win. i keep seeing the swon brothers really high in itunes this week (shocking as that is for me), and danielle has always been really high up there. i never would have considered the swon brothers til this week seeing how consistently high they’ve been in itunes 😦 and i guess i always thought it would probably be danielle because of her itunes rankings. in this case i don’t know that the two country stars will cancel each other out. usher so loves michelle that i don’t think it’ll be bad for her professionally if she doesn’t win because i think she will be under his wing. Can’t you buy one copy of each song and have it count in the vote totals? If that’s incorrect then, as Gilda Radner used to say; “never mind.” Keep in mind that each artist had two songs each the last few weeks, so if you were limited to buying only one, you would have to choose which one you wanted from your artist for the week. Clear me up please. Yeah, the Swon brothers have been mediocre at best. They might rise to the level of a regional band but no more in my view. They have played the game wisely though. It may appear cynical but the first thing they did that I appreciated was doing a tribute to George Jones. They also have supported the victims of the Oklahoma tornados as did Danielle and Michelle and Usher. Usher also appeared at the benefit fundraising concert for them. They have also stayed pretty close to traditional country music which there is a seriously neglected audience for. I think those things, along with them seeming like decent boys, have added to their fan base. They had an enormous turnout for their hometown visit as well. They were my least favorite of the top five and hopefully MCL is correct about who the last two standing will be. gene…i wasn’t clear. yes, i can buy two songs/voting period of both danielle and swon brothers, which is four votes. but i’m still not clear on what you are saying. ‘turn the page’ is a song i like. i liked it by bob seger. and then, when done by metallica, i played it over and over. holy cow, omg, i just went to check on my spelling of bob seger’s last name and saw that he is 68!!!! i liked the song okay by the swon brothers…but it made me go look for videos on youtube. gene, one thing i forgot to mention: i really do think ‘song choice’ will make a big difference with if michelle could win or not. if she picks a really great song(s), it would really help her. it seems that no matter what danielle sings, she’s always so highly ranked. i just listened to the two swon brother songs, and ‘listening’ i appreciated them more than i do ‘watching and listening’. I was trying to compare the iTunes votes to the other voting methods without mentioning the other methods, if that makes sense. With the phone, online or texting methods of voting, I believe the Voice limits the number of votes that you can place. So, if that is true, look at the same 20 voters from the previous example, half country and half pop voters. The 10 pop voters cast all of their votes for Michelle. If the country voters are voting for both country contestants then those contestants will come in 2nd and 3rd. With the iTunes method, there is no penalty for choosing to support more than one contestant. You don’ have to split your limited number of votes between two contestants. The only harm in it is you may be keeping a contestant in the competition that may end up beating your favorite. “Turn The Page” was a good song choice for the Swons, as was the Loggins and Messina song they did, “Danny’s Song.” Anne Murray did a great job with that song as well. (A little Canadian love) This week was their best week to date. Every contestant had minor glitches and they were no exception. They may pick up some cross over support from the fans of that area of pop/rock that crosses over to folk/ country like Buffalo Springfield, Poco maybe some CSN etc. It’s hard to believe all of the old rockers are… well… old rockers. It’s sort of like the old saying, “there are old pilots and bold pilots but no old bold pilots.” All three of them have a shot at the win I guess. okay, gene, now i understand what you were saying about voting numbers.